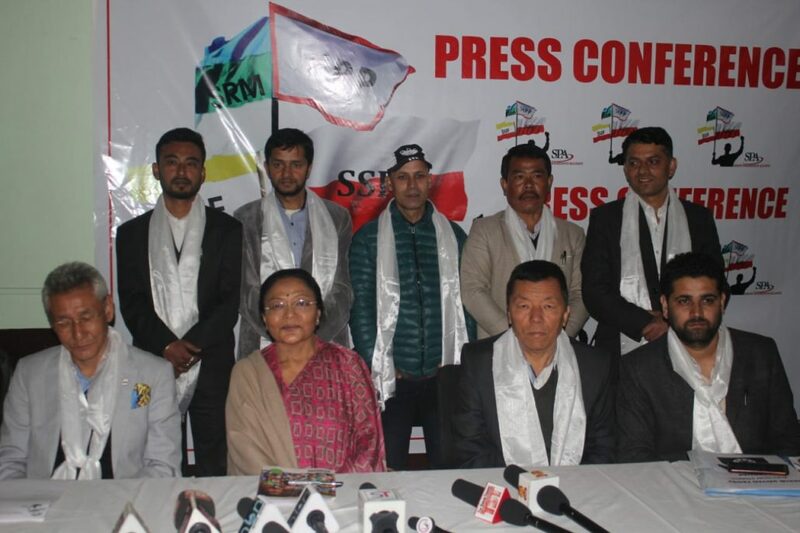 Sikkim Progressive Alliance (SPA) has announced its first list of nine candidates for the upcoming Assembly and Parliamentary Elections 2019 in the State. SPA is a recently formed alliance of four regional political parties of Sikkim for this election. The alliance has Sikkim Sangram Parishad (SSP), Sikkim National People’s Party (SNPP), Sikkim Rajya Manch (SRM) and Sikkim United Front (SUF). SUF president, Narendra Adhikari will contest on the lone Lok Sabha seat, while SRM president and sitting MLA, R N Chamling will contest from Rangang-Yangyang constituency and SNPP president, Delay Namgyal Barfungpa is the candidate from Gangtok constituency. Likewise, Tara Bhattarai of SSP will contest from Upper Tadong constituency, Bikash Darjee of SNPP from West Pendam constituency, Gopal Khatiwara of SNPP from Khamdong-Singtam, Phipranhang Subba of SRM from Namcheybong constituency, Datempa Sherpa of SRM from Daramdin and Ramesh Khanal of SUF from Rhenock constituency. Addressing a press conference in Gangtok on Monday, SSP president and former Lok Sabha MP, D K Bhandari, who is also the chairperson of SPA, mentioned that the alliance have been formed recently in a unanimous decision to fulfill the aspiration and desire of the people of Sikkim to see a strong alliance of opposition parties of Sikkim. She asserted that this election was very important for Sikkim so the people need to take it seriously to give their support to the right candidates. He added that SPA was an alliance of clean and transparent regional parties of Sikkim and will not comprise at any cost in the interest of the people of Sikkim. SNPP president Barfungpa informed that the common minimum programmes for the alliance have also been prepared. Likewise, SUF president Narendra Adhikari informed that every party in the alliance formed the parliamentary committees and choose the candidates in a very democratic manner.